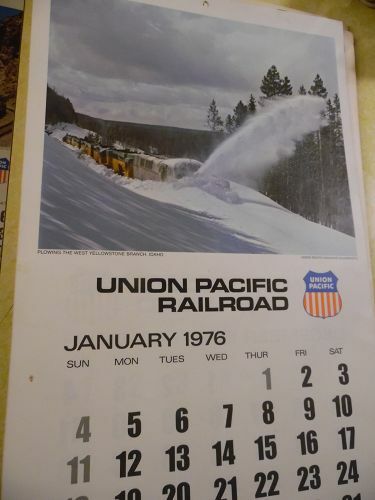 "1976 (Bicentennial logo on each page) ~ UNION PACIFIC RAILROAD CALENDAR ~"1976 (1)..vintage..Union Pacific..1976..Six page..flip over.."vintage"..size..(12 1/2"x 23")..This is a calendar with no writing and looks good as new. Not every picture has a train incorperated into the picture, only a few. January Train following the west Yellowstone branch, February Lake Powell Arizona, March Oregon Coast near Cape Mears, April Container train near Devil's Slide Utah, May Sunset on Diablo Lake Washington, June Trains protect the enviroment Omaha Nebraska, July Swope Park Kansas City Missouri, August Near Colombes Nebraska, September Restored strip coal mine Wyoming, October Lake Coeur D'Alene Idaho, November Autumn on the Guaranteed to be Old & Original & Genuine!. No tears or repairs. Only one picture here of the photo's and the calender is longer than photo and complete.